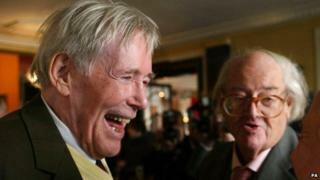 A selection of some of the best quotes from actor Peter O'Toole, who has died aged 81. "The only exercise I take is walking behind the coffins of friends who took exercise." "I woke up one morning to find I was famous. I bought a white Rolls-Royce and drove down Sunset Boulevard, wearing dark specs and a white suit, waving like the Queen Mum." "Stardom is insidious. It creeps up through the toes. You don't realise what's happening until it reaches your nut. That's when it becomes dangerous." "I'm a very physical actor. I use everything - toes, teeth, ears, everything. I don't simply mean physical in the sense of movement and vigour. I find myself remembering the shape of a scene by how I'm standing, what I'm doing." "I take whatever good part comes along," O'Toole told The Independent on Sunday newspaper in 1990. "And if there isn't a good part, then I do anything, just to pay the rent. Money is always a pressure. And waiting for the right part - you could wait forever. So I turn up and do the best I can." "The love of it is great, huge and it will be with me forever. I blundered into it, found I could do it well. It has raised me from nothing into something, not a lot, but something. If you do something well and you enjoy it, what more can you bloody well ask?" On the critical savaging of his stage Macbeth in 1980: "The thought of it makes my nose bleed." When the Academy originally offered O'Toole the statuette he requested as he was "still in the game and might win the lovely bugger outright, would the Academy please defer the honour until I am 80?". Upon receiving the lifetime achievement at the 75th Academy Awards in 2003: "Always a bridesmaid never a bride my foot!" "It is the same rules for us as it is for cricket, boxing, anything. We are an entertainment. We have to live and thrive in a competitive market. If we become an overprotected species we are dead." A month before his 80th birthday in 2012, O'Toole announced it was time to "chuck in the sponge" and retire from stage and screen. "The heart for it has gone out of me. It won't come back. My professional acting life has brought me public support, emotional fulfilment and material comfort. However it is my belief that one should decide for oneself when it is time to end one's stay. So I bid the profession a dry-eyed and profoundly grateful farewell."